On May 7th, GERONIMO STILTON & THE SMURFS arrives from Papercutz in comic book stores around the United States and Canada. Papercutz is participating as a Gold Level Member in Free Comic Book Day, bringing two of its most popular titles to an even larger audience with this promotion. Since launching in September 2009, GERONIMO STILTON graphic novels from Papercutz have sold over 400,000 copies. This series has been a huge hit in bookstores with less of a presence in comic shops. The GERONIMO STILTON chapter books have sold over 12 million copies for Scholastic. With GERONIMO STILTON & THE SMURFS Papercutz looks to bring plenty of Geronimo kid fans into comics shops, scheduling author and illustrator appearances at Barnes and Noble stores in the San Francisco Bay area during the week leading up to Free Comic Book Day and at “Lee’s Comics” and “Atlantis Fantasy World” in the bay area on that day. THE SMURFS originated in comics, first appearing in 1958 comic strips by their Belgian creator Peyo. After appearances in the comic series "Johan and Peewit", due to their popularity, The Smurfs were given their own comic series. Papercutz is reintroducing the original Smurfs comics to the world with its new graphic novel series. THE SMURFS graphic novels have been another wide success for Papercutz -- THE SMURFS #4 "The Smurfette" was one of the top 50 graphic novels sold in comic stores in January 2011. With "The Smurfs Village" game for the iPhone and the iPad out grossing the smash hit "Angry Birds" and a big-budget 3-D movie hitting theaters in August 2011, Smurfmania shows no signs of slowing down. 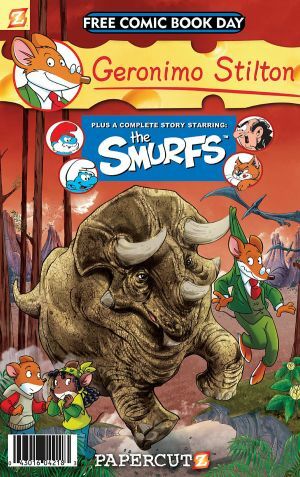 GERONIMO STILTON & THE SMURFS contains an eighteen-page excerpt from GERONIMO STILTON #7 “Dinosaurs in Action” along with the 8 page SMURFS story “The Smurf Submarine.” “The Smurf Submarine” has not appeared in any of the Papercutz SMURFS graphic novels to date. Also included in this comic book are 18 SMURFS comic strips, which have also never appeared in THE SMURFS graphic novels. www.papercutz.com for a full listing of THE SMURFS and GERONIMO STILTON graphic novels.